Thread: Thailand's oldest temple, anyone? The Mrs. seems to think it is wat-po in Bangkok, and she may well be correct. However, I always thought Ayutthaya or even Chiang Mai might boast an older temple. 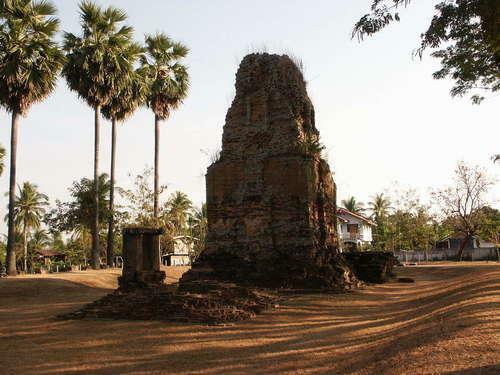 Google hasn't really cleared this one up, so does anybody know where Thailand's oldest temple is located? Wat Po is the oldest in Bangkok, but I would think some old Kymer temple up in Pimai. Dont know if Kymer would count as Thai but its from the 1100s I think. Be one of the historical parks that has the oldest I would imagine. Sukothai has some dating from 1200; the Thai language was born there under King Ramkhamhaeng, he invented it. Ayutthaya is newer by about 200 years. It was sacked in 1767. Good luck with getting a definitive answer though. Too bad, as I love history and Thai history is couched in obscurities it seems. Too bad, as I love history and Thai history is couched in obscurities it seems. No kidding. Pity it is. Pimai is a paradox to the Thai's. Its Buddhist but its Khymer. What about Phra Wiharn? must be many Khmer era temples still operating, if they are to classified as wats? nice post, then we add wat and temple. more problems. Some of the Khmer ones should be the oldest and were originally Hindu, like the main complex at Angkor Wat. Wat Po is positively modern compared with most in Thailand. Wat Phra Pathom in Nakhom Pathom was the first Buddhist temple in Thailand, built in the 4th Century AD. FFS. How the hell would I know. Not everything I know comes with a URL attached. Go find out for yourself, you lazy sod. Sometimes the sheer bloody bone idleness of some people just astounds me. Are you even able to take a dump without help? Sometimes the sheer bloody bone idleness of some people just astounds me. Are you even able to take a dump without help? Ooo, hyperbole aside; I've been looking. Why are you so grumpy, geez, I just asked. I definitely would have followed it (the link) as I don't take anything for granted or fact until I fact check it to my satisfaction; clear mai? Cheers. Not operating but I've been there. In Surin. Old as dirt. 7th century. There's a page on Dhammathai which says it's regarded as one of the oldest sacred sites in Thailand. It's funny but true about 'old' to an American. Funnier still, most buildings in Alaska are 20th century, the exceptions being from Russian days, mostly Orthodox churches. This really amazed visiting British friends. A large number have been built since the oil boom in the 1970's.